It was an afternoon to forget as Blyth were well and truly beaten as a superior Harrogate Town side enhanced their promotion hopes on Easter Monday. McCombe headed the hosts into the lead on 10 minutes, Wright doubled the advantage against the run of play before Sean Reid grabbed a goal back for Blyth. Dominic Knowles bundled home Harrowgate’s third before the interval and further goals in the second half from Thomson and Wright completed a comfoirtable victory for the Yorkshire side. 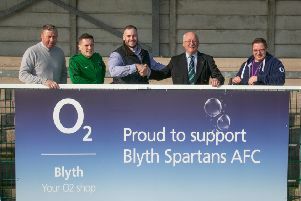 Blyth manager Alun Armstrong was forced into three changes as the Spartans looked to get their playoff hopes back on track. Joe Gorman, Jordan Laidler and Macauley Langstaff came into the side for David Atkinson, Ben Liddle and Dale Hopson respectively. The Spartans got the game underway in monsoon conditions but it was the hosts who deservedly opened the scoring on 10 minutes as a corner from Joe Leesley from the right was curled into the box and a simple header from McCombe was nodded home. Blyth responded with a change in formation and Laidler raffled the crossbar with a shot from distance. But it was Town who doubled their lead on 36 minutes. Moments after Jake Wright had seen a cross deflected up onto the cross bar, the forward was able to make it 2-0 when a corner was met with a towering header as Blyth switched off again from a set piece. Blyth pulled a goal back when Liddle crossed to the far post where the marauding Reid was able to volley home. But Harrowgate went 3-1 up before half-time, when, from another corner, Knowles bundled the ball over the line. The second half had barely got underway before it was halted as Ryan Hutchinson went down under an innocuous challenge with Falkingham. Hutchinson was stretched off and it seemed unlikely that he will be returning anytime soon. Thomson finished one on one with the keeper for 4-1 and the horrow show continued with Wright racing onto a long ball before he curled a sumptuous effort into the top corner. Next up for Blyth is a home game with Kidderminster on Saturday as both sides look to secure a play-off place.